Strapping Dispensers There are 6 products. Strapping dispensers are one of the unsung heroes of the strapping world. We’re here to tell you they’re indispensable. When it comes to strapping equipment, there are some serious pieces of kit available. Some take batteries, some cut through steel, some do a combination of jobs all in one and still manage to look as slick and stylish as Daniel Craig wearing Tom Ford Marko FT0144 sunglasses on his way to Waitrose. But in the less glamorous range of strapping accessories, spare a thought for the humble strapping dispenser. 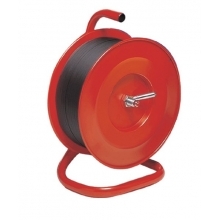 Although, if we’re honest, many dispensers look a bit like a glorified garden hose reel, you only have to try strapping without one to recognise their true and peerless value for the strapping professional. Trust us on that. 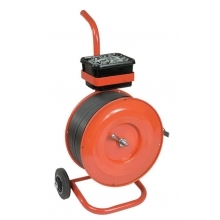 Depending on the strapping material you’re using, you’ll want the right dispenser that will allow the coil to be held firmly in place, transported as necessary, and dispensed correctly. We’ve got mobile dispensers for ribbon wound steel strapping, dispensers for polypropylene, complete with accessories trays. 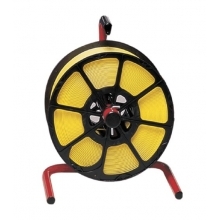 We’ve got wheeled heavy duty strapping dispensers that can hold your tools for convenience on the move. And we’ve got static plastic reel dispensers that stay put. When you’re storing any type of strapping, a decent dispenser allows you to keep everything you need in one place. It’s handy to have a fixed tray if possible so that you can keep any seals and strapping tools nearby. You can even order a kit from us that combines the tools, strapping, seals and dispenser in one tailor-made package. That’s a great solution if you have a smaller scale strapping project to do or need a starter kit that supplies everything you need. 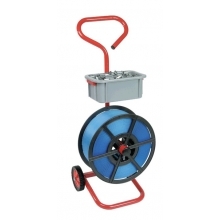 Plastic Reel Static Dispenser from the Pro-Series professional packaging range. Read the full product description. Polypropylene Strapping Mobile Dispenser from the Pro-Series professional packaging range. Read the full product description. 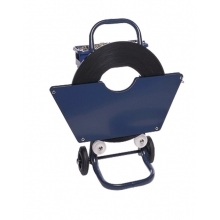 Mobile Steel Ribbon Strapping Trolley from the Pro-Series professional packaging range. Read the full product description. Polypropylene Strapping Static Dispenser from the Pro-Series professional packaging range. Read the full product description. Mobile Dispenser Woven Polyester Strapping from the Pro-Series professional packaging range. Read the full product description. Composite Strapping Mobile Dispenser from the Pro-Series professional packaging range. Read the full product description.